The Model for Increasing Organizational Resilience is based on ISO 22316: Security and Resilience – Organizational Resilience Principles and Attributes. 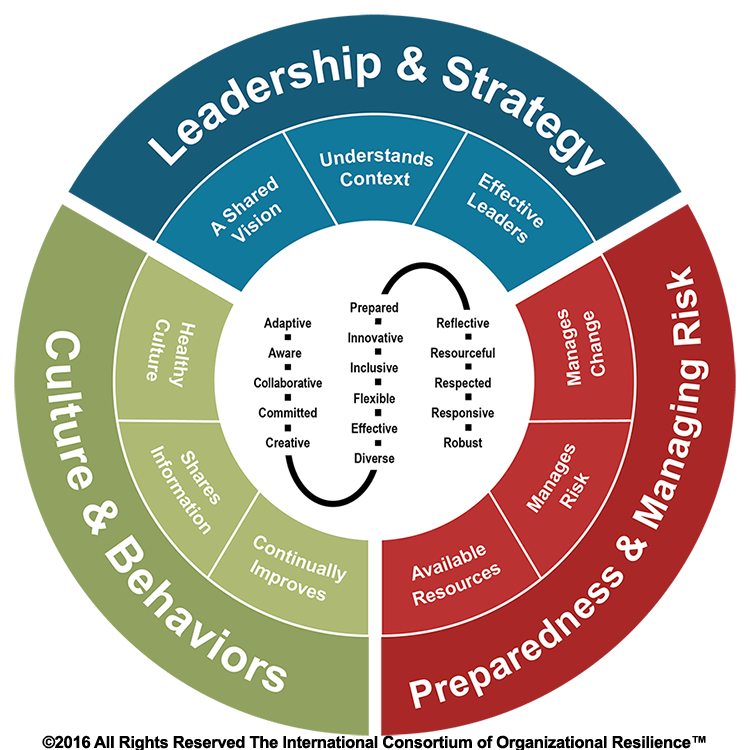 The Organizational Resilience Model is comprised of 3 Environments, 9 Strategies, and 16 Behaviors. Each organization is unique. The way organizational resilience is implemented is also unique, however studies have shown that there are common attributes and behaviors demonstrated by organizations that have survived and thrived during times of change and uncertainty. 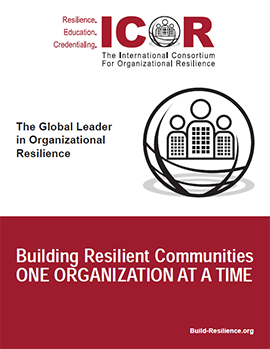 Contact us to donate or share a resource that supports the Organizational Resilience Model. 3 Environments: The 3 environments are each comprised of 3 strategies that can be implemented to increase the resilience of an organization. 9 Strategies: Each strategy can be implemented on its own or in combination as part of the overall organizational resilience strategy. 16 Behaviors: The identified behaviors describe how more resilient organizations behave. These behaviors are considered to be important in preventing breakdown or failure; or enabling appropriate and timely action to be taken. They distinguish a more resilient organization from one that is simply well-run, successful, or prosperous. Organizational resilience is increased and enhanced when the organization demonstrates leadership qualities and intentionally implements strategies. A Shared Vision: The members/employees of the organization clearly understand the purpose, vision, and values of the organization. Understands Context: There is a comprehensive understanding of both the internal and external environments of the organization. Effective Leaders: Leaders are effective and empowered, are trusted and respected, and leadership is distributed throughout the organization. Organizational resilience is increased and enhanced when there is an intentional effort to ensure a healthy culture throughout the organization. Healthy Culture: The existence of core values and behaviors that support the health and welfare of its members/employees, foster creativity and empower members/employees to communicate effectively. Shares Information: Information and knowledge is shared to enable effective decision-making, learning from experience and from others is encouraged and valued, and is recognized as a critical resource of the organization. Continually Improves: Performance is continually monitored and a culture of continual improvement is encouraged. Organizational resilience is increased and enhanced when the organization intentionally manages risk and prepares for the unexpected. Available resources: Resources are adequate and available when needed in order to provide the ability to adapt to changing circumstances. Manages Risk: Risk is managed throughout the organization and the use of management systems used as appropriate. Manages Change: Ability to anticipate, plan, and respond to changing circumstances and incidents. Flexibility implies the ability to change, evolve and adapt in response to changing circumstances. This may favor decentralized and modular approaches to infrastructure or ecosystem management. Flexibility can be achieved through the introduction of new knowledge and technologies, as needed. It also means considering and incorporating indigenous or traditional knowledge and practices in new ways. The ability to be flexible and adaptive during a disruption might be demonstrated by developing new plans, taking new actions or modifying behaviors so that you are better able to withstand and recover from it, particularly when it is not possible or wise to go back to the way things were before. Adaptability also suggests flexibility, the ability to apply existing resources to new purposes or for one thing to take on multiple roles. The ability to constantly assess, learn and take in new information on strengths, weaknesses and other factors through sensing, information gathering and robust feedback loops. Two or more parties working together towards a common purpose or goal. It is something accomplished by working together with others. With a collaborative effort, a big job can be completed in less time. Collaboration is necessary to increase resilience and requires cooperation and respect between those parties and helps to bring teamwork. To be willing to give time and energy to something you believe in. A demonstration of commitment to increasing the resilience of the organization. Increasing resilience requires creativity. It is the ability to make new things or think of new ideas. Creativity is characterized by originality of thought and having or showing imagination. It is the ability to transcend traditional ideas, roles, patterns, etc., in order to create meaningful new ideas. Diversity implies that a person or system has a surplus of capacity such that they or it can operate successfully under a diverse set of circumstances, beyond what is needed for everyday functioning or relying on only one element for a given purpose. Recognition of the diverse nature and characteristics of different people needed for organizational resilience and the diverse nature and characteristics of organizations needed within each community. This diversity includes a range of capabilities, information sources, technical elements, people or groups that are needed for effective resilience building initiatives. Diversity is also needed for the necessary range of skills and capacities, methods or techniques needed to prepare for and respond to shocks and stresses. Inclusion emphasizes the need for broad consultation and engagement or other people, organizations, and communities. Addressing the shocks or stresses faced by one person, organization, or community in isolation of others is an anathema to the notion of resilience. An inclusive approach contributes to a sense of shared ownership or a joint vision to build resilience. Being integrated means that individuals, organizations and communities have the ability to bring together disparate thoughts and elements into cohesive solutions and actions. It considers horizontal and vertical integration between individuals, organizations, and communities as well as across sectors and scales, as essential for building resilience to shocks and stresses. Integrating an understanding of risk into budgets and investments, the sharing of information, knowledge, communication, tools and methodologies are common themes that are seen to enhance efficiency and effectiveness in resilience building. Integration and alignment between individual, organizations, and community systems promotes consistency in decision making and ensures that all investments are mutually supportive to a common outcome. Integration is evident within and between resilient systems, and across different scales of their operation. Exchange of information between systems enables them to function collectively and respond rapidly through shorter feedback loops. To be prepared means to be ready beforehand and to work out the details of a plan of action in advance. Being prepared means the organization has taken efforts to be equipped with the necessary resources to manage change and to meet unforeseen circumstances. It means having thought out beforehand any incident or situation that might occur so that you know the right thing to do at the right moment and are willing to do it. Being prepared is the opposite of being reactive. Redundancy refers to spare capacity purposely created within systems so that they can accommodate disruption, extreme pressures or surges in demand. It includes diversity: the presence of multiple ways to achieve a given need or fulfil a particular function. Redundancies should be intentional, cost-effective and prioritized. Accepting of the inherent and ever-increasing uncertainty and change in today’s world. They have mechanisms to continuously evolve, and will modify standards or norms based on emerging evidence, rather than seeking permanent solutions based on the status quo. As a result, people and institutions examine and systematically learn from their past experiences, and leverage this learning to inform future decision-making. Resourcefulness implies that people, organizations and communities are able to rapidly find different ways to achieve their goals or meet their needs during a shock or when under stress. This may include investing in capacity to anticipate future conditions, set priorities, and respond, for example, by mobilizing and coordinating wider human, financial and physical resources. Resourcefulness is instrumental in being able to restore functionality of critical systems, potentially under severely constrained conditions. The organization is respected by others – is admired and held in high esteem for its qualities or achievements. In more resilient organizations, there is respect between not only the different parts of the organization but between the different personnel who make up the organization. It means acting in a way that you are aware of and approve of others’ rights, wishes, and opinions. to react quickly, appropriately, and positively. To be responsive means to be alert and aware and to react in a way that is needed, suitable, and right for a particular situation. Well-conceived, constructed and managed physical assets that are able to withstand the impacts of hazard events without significant damage or loss of function. Anticipates potential failures in systems, making provision to ensure failure is predictable, safe, and not disproportionate to the cause. Self-regulated implies that an individual, organization, or community can deal with hazardous or stressful events without significant malfunction, collapse, or cascading disruption. This ensures any failure is discrete and contained.